The 2017 Hawaii Legislative Session started on January 18 with prayers, speeches, and music. Hawaii residents definitely need the prayers – our lawmakers have been busy, introducing 1,601 bills in the House of Representatives and 1,317 bills in the Senate. It’s a mountain of paperwork, negotiation, tax dollars, and details. Every year, I do a legislative round-up that spotlights bills that could have a big impact on Hawaii. I will focus on taxes, education, individual rights vs. government powers, controversial issues, and (in my opinion) unnecessary and wasteful spending. With over 2,900 bills being proposed in 2017 and less time than ever to read through them, I rely as always on bill summaries to accurately reflect the bills’ intentions. Here is an overview of the significant tax bills being proposed in the 2017 Legislative Session. I’ve organized the bills into two sections: 9 tax increases to watch out for and 7 bills that could save us time and money. If I’ve missed any important bills, please let me know! Taxes on Internet purchases. HB398 and SB161 would require out-of-state businesses to collect general excise (GE) taxes. HB1413 creates a “voluntary” program. This is taxation without representation for out-of-state businesses, and it would be a burden on Hawaii residents who already pay higher shipping costs. Higher general excise (GE) taxes. HB1319, SB1132 and SB1132 would increase the general excise tax by 0.5% to fund education. HB924 would increase the GE tax by 1% to fund agricultural land purchases. Any GE tax increases should be looked at with suspicion, because they tax transactions from wholesale to distribution to retail. Higher property taxes. HB180, HB182, HB1254, and SB686 add an education surcharge on residential investment properties and visitor accommodations. Real estate and property taxes are high enough – this could be a small step towards adding an education surcharge for everyone. Permanent county surcharges on GE taxes. HB349, HB1442, HB1565, SB432, and SB1183 would make county surcharges permanent. SB576 and SB1176 would extend the county surcharge on mass transit beyond 2027 and allow the surcharge to be used for operation and maintenance of mass transit, as well as public transportation and road maintenance. SB1278 would extend the county surcharge on mass transit to 2047 and allow the surcharge to be used for affordable housing and transit-oriented development. Apparently, there is no such thing as a “temporary” tax. New family leave insurance tax. SB408 would create a family leave insurance program and require employees to make contributions into a trust fund. No new payroll taxes! Higher costs to own and operate a car. HB1144 and SB1010 would increase the state motor vehicle weight tax. HB1145 and SB1011 would increase the state motor vehicle registration fee. HB1146, SB1009 and SB1012 would increases the State Fuel Tax. HB1259 and SB1187 would add a clean transportation fee. Higher taxes won’t necessarily make our roads better-maintained. New tax on sugar-sweetened beverages. HB1210, SB375 and SB837 would add a fee on sugar-sweetened beverages. Higher taxes on cell phones and cell phone plans. HB206, HB1021, and SB887 would add a 2.64% surcharge on prepaid wireless services for Enhanced 911 services. Discouraging visitors from coming to Hawaii. HB401 would increase the rental motor vehicle customer facility charge from $4.50 to $9.00. HB546 would increase the transient accommodations tax (TAT) to fund workforce housing development. HB1453 and SB1143 would add a $20 visitor tax to fund conservation. Why penalize visitors for spending their time and money in Hawaii? Repealing the county rail surcharge. HB970 would end the 0.5% county surcharge for Honolulu mass transit. Repealing the estate tax. HB364 would end the inheritance and estate taxes. We shouldn’t have to pay taxes on money that was already taxed. Lower income taxes for lower-income taxpayers. HB362 and HB690 would decreases income taxes by twenty-five per cent for all but top income earners. More county surcharge taxes benefiting the county. HB719 would reduce the amount of the county surcharge that goes to the State from 10% to 5%. HB1072, SB431, SB938, SB1242, and SB1276 do not specify the lower reimbursement rate. HB1002 would reimburse the State 0.5% and use 9.5% for infrastructure improvements along the rail corridor. A new earned income tax credit. HB209, HB212, HB352, HB670, SB508, SB648, and SB707 would create an earned income tax credit. Extending the food/excise tax credit. HB209, HB210, HB932, SB256, and SB648 would extend the food/excise tax credit. Quarterly withholding tax filings. HB1141 and SB1007 would allow withholding taxes to be paid quarterly instead of monthly. We could save time, paperwork, and record-keeping. 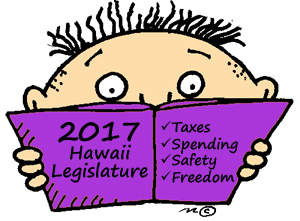 The 2017 Hawaii Legislature adjourns on May 4. Please think about these issues and how they may affect you, everyone around you, our children, and our grandchildren. Whether you have concerns or feel strongly about an issue, speak up, talk about it, and be part of the discussion! I never understood why there is so much support for a national, single-payer healthcare system – until I started working in a small medical office. Just last year, I believed that commercial health insurance is good for consumers. 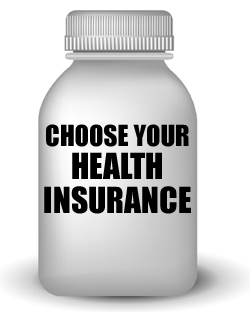 It is better for us as patients, in terms of flexibility (choosing the plan that fits you), choice (access to doctors you trust), and price (insurance plans must compete for your business, keeping their premiums reasonable and benefits attractive). It is better for healthcare providers, because they can choose which healthcare plans to accept; insurance companies with unreasonable requirements or low reimbursement rates could be avoided. Theoretically. For healthcare providers, our current healthcare system can be a nightmare. Each healthcare plan has different copays, different deductibles, and vastly different levels of reimbursements. Some payers reimburse providers promptly; some payers may take months. It’s not fair to providers, who may have to wait a long time before they get compensated for their work. How many of us would go to work if we are not sure how much we will get paid, or when we’ll get a paycheck? Even a small medical office, with a limited number of healthcare providers and billing codes, generates a lot of paperwork. Electronic billing helps, but there are still pre-authorizations, progress notes, requests for documentation, paper claims for payers who don’t accept electronic billing, and customer service phone calls to find out the status of a claim or why a claim was denied. I’ve had problems with two insurance companies who each insist that the other is “primary” and should be billed first. I’ve had claims that get lost in the system, and then have to be “escalated” for payment. I’ve learned that military plans are “secondary” payers – except when they are “primary” payers. For healthcare providers, I see the allure of a single-payer system: one claim form, one customer relations contact, one billing contact. Theoretically. But the more I learn, the more I realize that a single-payer health insurance could be an even bigger nightmare than our current system. A monopoly on healthcare coverage, authorizations, and payments would not be good for anyone. Consumers would have a limited choice of plans and providers, and under current law would be forced to buy health insurance that they may not be able to afford. Healthcare providers would have little recourse if the single-payer refuses a claim or underpays a claim. In a short time, I’ve realized that the government health insurance payers (military, veterans, Medicare, and Medicaid) are the most difficult payers to work with. Government payers often take longer to reimburse providers – sometimes three times as long as commercial insurance companies. Government payers often pay providers less – sometimes 25% less than commercial insurance companies. Government payers often fall short in informing people that they need to have an authorization before they see a healthcare provider – and there is little recourse for appeals. I was beguiled by the idea of single-payer health insurance, until I realized that the single-payer would be a government payer. I’ve come full circle, skeptical that single-payer health insurance would be an improvement over our current healthcare system. If you work in the healthcare profession, what has been your experience with medical billing and claims? If you’ve lived in a country with a single-payer health insurance, what has been your experience with medical costs and care? When I was younger, Valentine’s Day was about storgē (familial love) and philía (brotherly love) – with time spent with family, cards to all my classmates, heart-shaped cookies (with frosting and sprinkles), and cupcakes. As a young adult, Valentine’s Day swelled to include éros (romantic love) – with flowers, a special dinner, or a night out with friends. As a parent, Valentine’s Day broadened to agape (unconditional love) – putting children and family first, giving my son the last cookie. You don’t need to buy candy, gifts, or flowers to celebrate Valentine’s Day. You can read, write, or click love. 1. Read. Read a love story –a romance, short story, poem, novel, or biography about someone who loves deeply, about close friendships; about enduring love; about giving relationships with animals. For a fantasy romance about true love, read “The Princess Bride.” Or get inspired by reading love letters on MyDearValentine.com. 2. Write. Write a note describing a time when you felt especially loved, or something you have done to make someone else feel especially loved. Write a love letter to a friend or mentor. Or write a Valentine’s Day Coupon Book, with ideas like a movie night, ice cream for dinner, or staying up extra late. Happy Money Saver has collected 10 fun free printables for kids and adults. 3. Click. Spend time with the people, animals, and places you love, and take photos to commemorate your time together. When my son was younger, I enjoyed creating photo Valentine’s Day cards. One of my favorites was posing his body to spell out the word “LOVE” (the photo in this post). Today, it’s so easy to customize photos with words and clipart to send a special message. How do you celebrate Valentine’s Day? What is the most memorable way someone has shown you that they care? So far, 2017 has delivered a one-two punch for Hawaii residents. 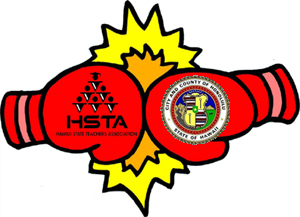 In January, as we were still reeling from holiday celebrations and new year’s resolutions, the Hawaii State Teachers Association (HSTA) proposed a constitutional amendment to add a property tax surcharge on residential investment properties as well as a visitor accommodations surcharge (Honolulu Star-Advertiser, “HSTA pitches property tax, hotel surcharge to hire, retain teachers,” 1/24/17). The surcharges could raise $500 million a year for hiring and retaining teachers. A week later, Honolulu Mayor Kirk Caldwell proposed offering the State of Hawaii a larger share of the of the 0.5% general excise tax surcharge that was intended to fully fund the rail project, in exchange for extending the surcharge in perpetuity. The State’s “share” is currently 10% (Honolulu Star-Advertiser, “Mayor proposes larger share of rail tax for state,” 2/1/17). Is it reasonable to require homeowners to pay higher taxes for a service that is unrelated to their home or property? Is it reasonable to require non-residents to pay a dedicated tax for Hawaii public education? Is it effective to create a dedicated funding source that has little oversight by Hawaii legislators and taxpayers? Public education is funded by state income taxes and the general excise tax. Hawaii’s property taxes can barely pay for the current level of city services; and the transient accommodations tax (TAT) has already jumped to 9.25% in 2017. It’s disingenuous to compare Hawaii’s real property taxes and TAT to other U.S. cities – Hawaii residents have higher costs of living and lower availability of land and affordable housing than other mainland cities; and visitors face higher transportation costs and time commitments just to travel to Hawaii. In greater numbers, homeowners could be forced out of their homes and visitors will choose to vacation elsewhere. Is it reasonable and effective for the City and County of Honolulu to claim that they need to make the rail surcharge permanent, while simultaneously claiming that they don’t need the full amount of the surcharge? The Honolulu rail is funded by the general excise tax surcharge. Without another extension, or making the surcharge permanent, Honolulu rail may not be built. But offering the State of Hawaii an even higher percentage of the general excise tax surcharge seems like a bribe to Hawaii legislators in exchange for their support. For some perspective, in Fiscal Year 2016, collections of Honolulu’s county surcharge totaled $259.2 million, according to the “Hawaii Department of Taxation Annual Report 2015-2016” (page 30). The State kept 10% of the surcharge collected or $25.92 million – which is more than the Department of Taxation’s entire Fiscal Year 2016 operating budget of $24 million (page 37). Do you think these tax proposals are good ideas? How do you rank public education and Honolulu rail on your list of priorities for Hawaii? In school, we discuss the impact of the missionaries in Hawaii – the positive impacts, like literacy; the negative impacts, like the suppression of cultural traditions; and the lasting impacts, like the success of missionary descendants in accumulating land and wealth. But we seldom think about why missionaries came to Hawaii. Cook based his narrative on primary research and interviews with family and descendants. The biography is scholarly and densely written, with meticulous detail. It is not for the casual reader; it is intended for those with a scholarly interest in Hawaiian history and early foreign Christian missions from New England. It is as much about the changing world around Obookiah as it was about Obookiah himself, illustrated with historical drawings, photographs, maps, excerpts, and quotes. At times, there are tangential discussions of life in the 1800s, such as life for sealers on Isla Guadalupe (I was disturbed and amazed to learn that 50,000 fur seal skins were harvested in 1808 by the sealing crew of the Triumph), the design of Guilford merchant ships, and an exhaustive discussion of the New England religious revival. ‘Ōpūkaha’ia (1788?-1818) was born in Ka’ū, Hawaii Island possibly in 1788. Life in Ka’ū could be harsh: drinking water was scarce (divers had to fill hollow gourds with fresh water from underground springs), the grasslands were dry, and there were some times famines. At age 10, ‘Ōpūkaha’ia was orphaned in the war between Chief Nāmakehā and Kamehameha. For one year, he was a captive of the warrior who killed his family in front of him, until his uncle Pahua, a kahuna pule (praying priest) at Hikiau Heiau, claimed him. In 1808 at around age 20, Obookiah was invited by Captain Caleb Brintnall (1774-1850) to sail aboard the merchant ship Triumph, along with 12-year old “Hopu” Thomas Hopoo. Eager for a new start, Obookiah signed on as a sailor, escaping from his room when his uncle Pahua forbade him to leave. After struggling with his faith, he embraced Christianity whole-heartedly and advocated for a Christian mission to Hawaii, looking forward to the day he could return home. He helped build an ‘ohana of Owhyhee youths whose lives were disrupted by war and political uncertainty in Hawaii, including “Hopu” Thomas Hopoo, the royal prince of Kauai George Tamorree (George Prince Kaumuali’i or Humehume), William Tennooe (Kanui), and John Honooree (Honoli’i). He began translating the Bible into Hawaiian, and started writing a primer of Hawaiian and English words. Obookiah never returned to Hawaii; he died of typhus fever in 1818, a year before the Sandwich Islands Mission set sail. Obookiah’s life was indeed providential: he escaped death as a boy; was sponsored by a Christian sea captain, Captain Brintnall, who did not treat him as a slave; found supporters and benefactors who gave him room and board in their own homes and arranged for him to receive an education; and was championed by a passionate anti-slavery advocate, Father Samuel Mills. 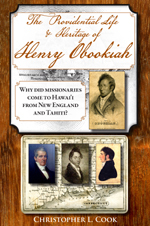 Hawaii would be a much different place if Obookiah had not defied his uncle, become a sailor, made Christian friends, or sparked a missionary fervor for Hawaii. Henry Obookiah’s experiences and journal are collected in a book, “Memoirs of Henry Obookiah,” and published by the Woman’s Board of Missions. You are currently browsing the Better Hawaii weblog archives for February 2017.